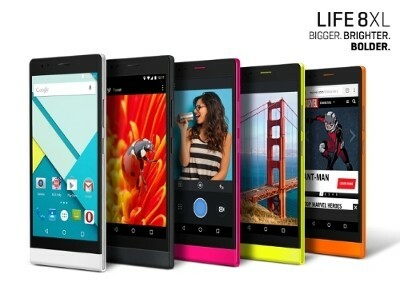 Along with the new Life One 2015 Edition, BLU announced the new 5.5″ display Life One 8 XL today. This dual-SIM, 8-core powered phone features 8GB of on-board storage which you can expand an additional 64GB with a Micro-SD card, 1GB of RAM, a 8MP rear facing camera and will be upgradable to Lollipop in the July time frame. This new phone will be available starting July 1 and is available for pre-order for only $129. Built inside the Life 8 XL is a 5.5-inch HD display with 268 ppi, utilizing full lamination, IPS, and OGS technologies with an incredible color reproduction, brightness and quality for a perfect viewing experience. Camera options include an 8.0 mega pixel main camera plus 2 mega pixel front facing camera. The LIFE 8 XL’s memory configuration includes 8GB built in storage plus 1GB RAM, with an expandable Micro SD slot of up to 64GB. Additional features include Dual SIM Dual Active technology for multiple SIM card support.